Offer a convenient, centralized marketing library. You create a lot of marketing materials to help your distributors build their business. The challenge is organizing all those materials into a centralized location to make them available to everyone . . . anytime they need them. Offers an online content library that makes it easy for everyone to find what they need — and lets them choose how they want to find those materials. Allows for customized navigation that’s intuitive for your users and reflects the strategic goals you want to help your users accomplish. Gives you confidence and peace of mind that your brand identity and corporate standards remain intact while users get the ability to personalize marketing materials with their own contact information. Find it fast… a convenient shortcut that allows searching by a keyword, product or type of material. List of favorites… a helpful tool that makes finding and re-sending the same materials to a different group fast and easy. 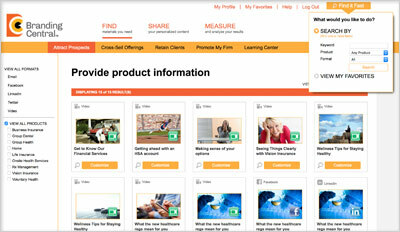 Preview image… so you can quickly see each item in the centralized library at a glance and how it will be personalized. Drop-down filters… which conveniently help refine searches for materials. Easy downloads of materials right from the details window. Supports multiple formats and templates including collaterial, video podcasts, emails, social posts and more so you have a single location to store and organize your materials.